Drink plenty of water. The daily recommended amount is 8 glasses of water. Eat Healthy. You will provide your hair with the proper nutrients it needs to grow and look its best. Avoid Heat. Heat adds stress to your hair. If you have to use heat always apply a heat protectant to minimize damage. Keep your hair clean. Shampoo your hair regulary to keep from clogging your pores. Protect your ends. 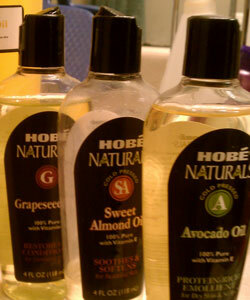 Oil or moisturize your ends daily to keep them from breaking as your hair grows. Do not braid your hair too tight. This can cause alopecia which is the leading cause of hair loss amongst African American women! Try different methods of hair extensions. Any hair extension or weave method that requires glue & heat is extremely damaging to our hair. This would also include glued-in hair extensions. Sewn in weaves are more expensive, but is perhaps a better way to go because hair is normally cornrowed and protected as extensions are sewn into them. Avoid spritz. Any style that will “freeze” the hair into place is very damaging to black hair. Anything that makes the hair hard and crunchy should be left alone. Avoid rubbing hair. When drying hair, do NOT vigorously rub the hair with a towel to dry it. Always remember that our hair needs to be handled with extreme care. Gently pat the hair dry. Do Not Grease/Oil your scalp. This can clog the pores of the scalp. These clogged pores suffocate the hair follicles and lead to unnecessary hair loss (i.e. oil folliculitis). Oils should be applied directly to hair only, not to the scalp. Combing Methods. Be patient and gentle with your hair when combing. Use a wide tooth comb to gently detangle hair before combing. This can prevent breakage. Use satin night scarves. 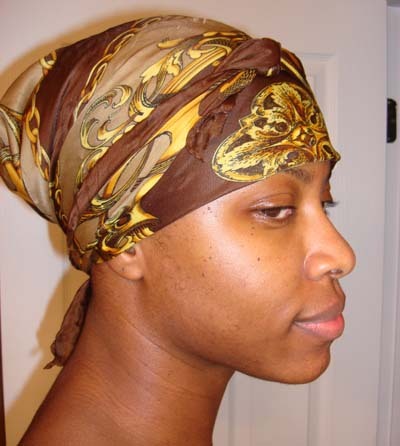 Be sure to rotate the position of the scarf when wrapping hair at night so that the point where the knot is tied does not always rest in the same place. The top (forehead) area is ideal since most people tend to sleep on their backs or sides. Posted on August 4, 2012, in Fab Got Style and tagged beauty, hair, hair care, hair growth, natural beauty, style. Bookmark the permalink. Leave a comment.